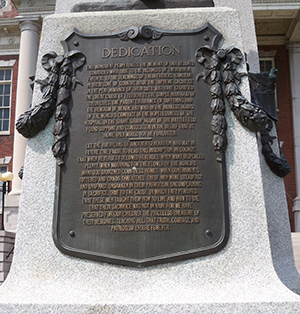 DEDICATION: This monument perpetuates the memory of our beloved comrades who, true to the instincts of their birth, faith to the teachings of their fathers, constant in their love of country, made the supreme sacrifice in the performance of their duty; who have glorified the great cause of freedom by the simple manhood of their lives. 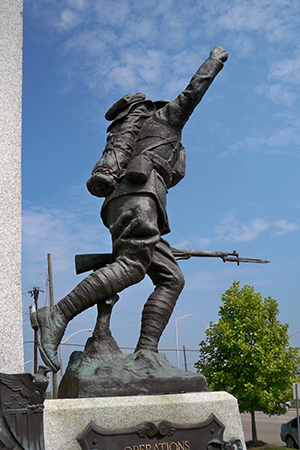 The patient endurance of suffering and the heroism of death, and who, in the darkest hours of the world's conflict, in the hopelessness of the hospital in the short sharp agony of the battlefield found support and consultation in the belief that at home they would not be forgotten. Let the Americans of another generation who may in future time pause to ear this inscription recognize that when reverses followed reverses, when want displaced plenty, when mourning for the flower of the world's manhood darkened countless homes. When governments tottered and chaos threatened, these men were steadfast and unafraid, unshaken in their patriotism, uncomplaining in sacrifice, true to the cause, in which they perished that these men taught them how to live and how to die. That their sacrifice was not in vain. For we have preserved for our children the priceless treasure of their memories. Teaching all that truth, courage and patriotism endure forever. 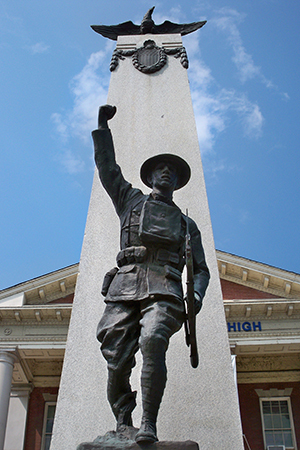 This World War I monument, erected in 1921, stands on the front lawn of Old Knoxville High School.